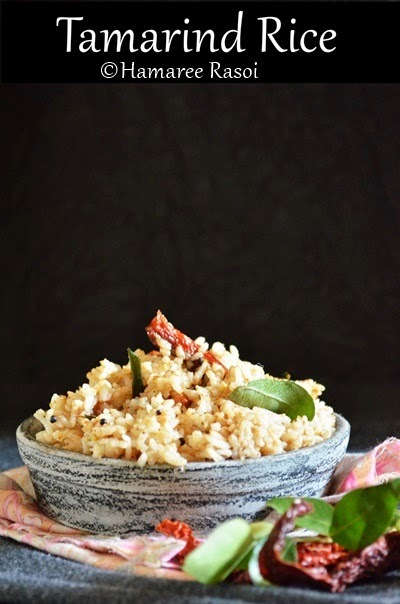 This is a special recipe because I had learnt it from a fellow passenger while I was travelling from Bangalore - Chennai. A middle aged Aunty was generous enough to share her tamarind rice with me which she had packed for the journey. Well no I haven't forgotten any of my Ma's intructions which she used to remind us every 5 minutes before any train journey. "Keu kichu diley ekdom khabe na" (If anyone offer you anything to eat, say no!) But this was unavoidable as she was sitting next to me in a double decker train, where you almost inhale co-passenger's breath and guess what they ate in the morning :-). This Aunty kept insisting me to taste her homemade tamarind rice, I politely said thank you Aunty but I am not feeling hungry, she won with her persistent request. But it was really tasty, so I asked her the recipe. Since then it has become my staple food whenever I have a need to use leftover rice. Today I am sharing it with my readers. Now since I find it easy to work with readymade tamarind pulp I just mix it with 1 cup warm water and stir it well. Heat the oil in a pan on medium heat and add mustard seeds. Let them pop and then add red chilies, chana dal, peppercorns and curry leaves. Do not let these burnt and immediately add peanuts, fry for a while. Add turmeric powder, asafoetida and tamarind water. Season with salt and the dry fine powder and cook till it thickens and looks like paste. Add rice in portions and keep mixing. Serve hot with pickle and enjoy. 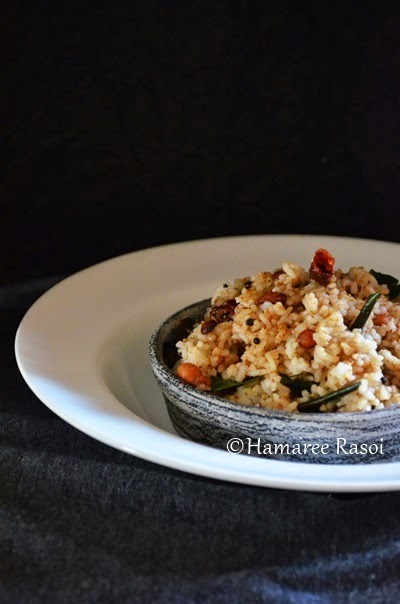 read more.. "Tamarind Rice Recipe | Imli Chawal "
Making lemonade is not a rocket science but still it tastes different if you taste it at various places. Making sugar syrup is the key for me. I take about 1/2 sugar, 3/4 cup water and heat in a small saucepan on low heat until the sugar is dissolved completely. For that extra zing I add 2 tsp orange peel into it once it comes to room temperature. Use as per your requirement and you can keep the remaining syrup in a clean bottle inside the refrigerator. Today's recipe has been adapted from Shatbhi Basu's Cucumber & Curry Leaf Lemonade. This recipe is a part of the Sparkling Himalayan Contest , exclusively for IFBM 2014 participants. 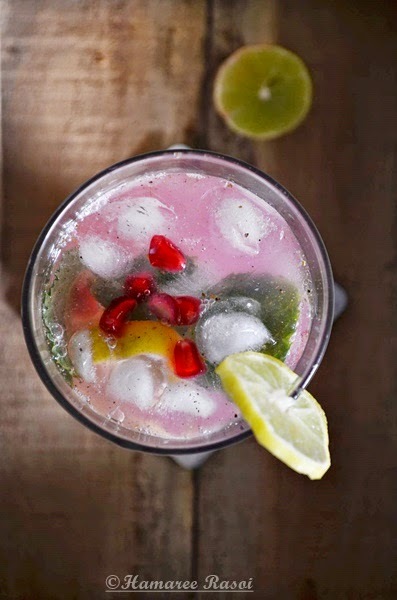 Fill a tall glass with lots of ice cubes, add lime wedges and add little crushed curry leaves. Add orange juice stir it and add lime juice. Time to add sugar syrup and finally sparkling Himalayan water (or club soda). 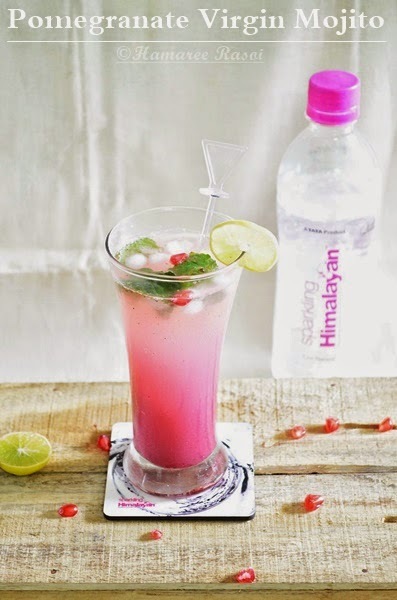 Unlike other club soda Himalayan sparkling water has a mild fizz along with it. 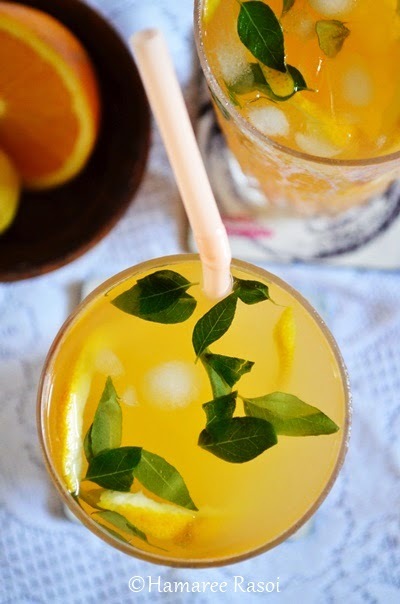 Stir well and serve this perfect Orange and curry leaf lemonade. Cheers! 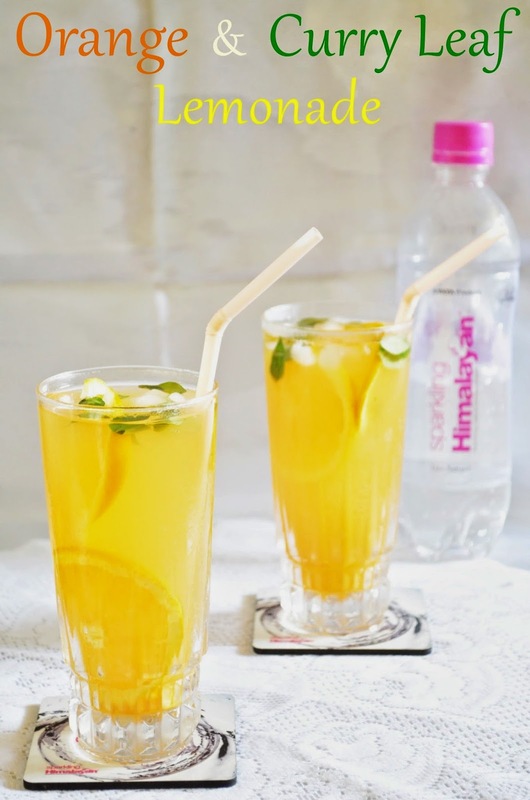 read more.. "Orange & Curry Leaf Lemonade | Himalayan Sparkling Water Contest"
Another thing that I have observed is that we are between the end of the summer period and monsoon is approaching in full vigor, so it’s time that we should change our seasonal based fruits in our daily intake and mix them with our drinks( not necessary alcoholic). 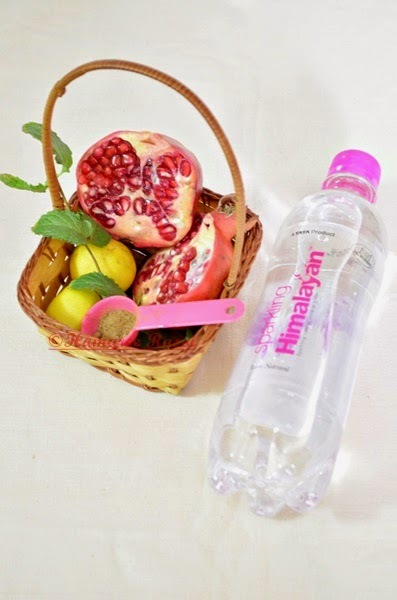 Also to add renowned brand Himalayas Sparkling water guarantees purity in every drop of drinks that I conjure. 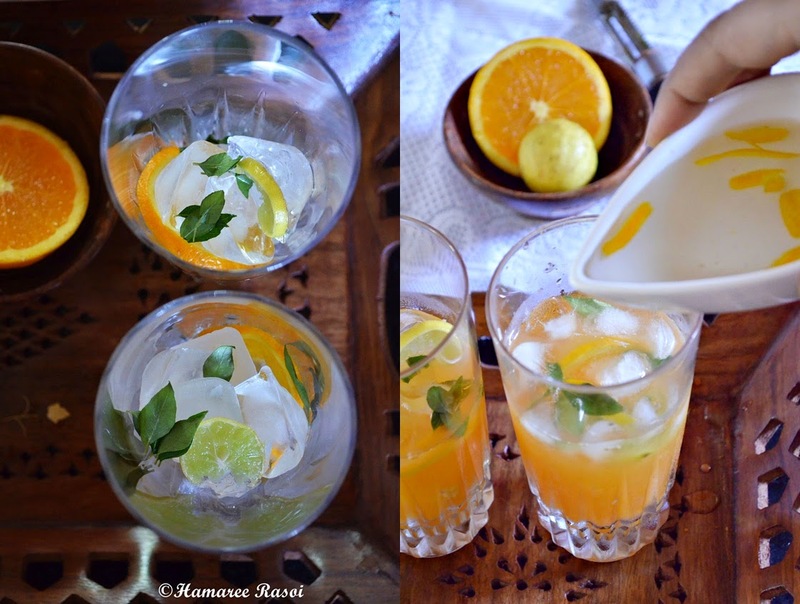 Today's recipe has been adapted from Shatabi Basu's Peach Mojito. This recipe is a part of the Sparkling Himalayan Contest , exclusively for IFBM 2014 participants. Chop off the ends of pomegranate and then cut it into four parts. Take a big bowl of water and start separating the seeds from the skin ( I put my son to pull all the arils out). The seeds will sink to the bottom. When you are done pour the water along with the seeds to pass through a sieve. place the drained seeds in a blender until you get a pulp. Pass it through a sieve or cheesecloth to get the juice. Keep aside 60 ml of juice. Take a tall glass, squeeze some lime wedges and lightly muddle them. Smash a few tender mint leaves in your hands by clapping them together and twisting. This brings out the best flavours. Add chat masala, throw in some ice cubes and add pour pomegranate juice. And finally add sparkling water and give it a nice stir. Serve immediately. Do you know that I have a separate HamareeRasoi FB Page? If you haven't LIKED my page yet then may I request you to do the same. 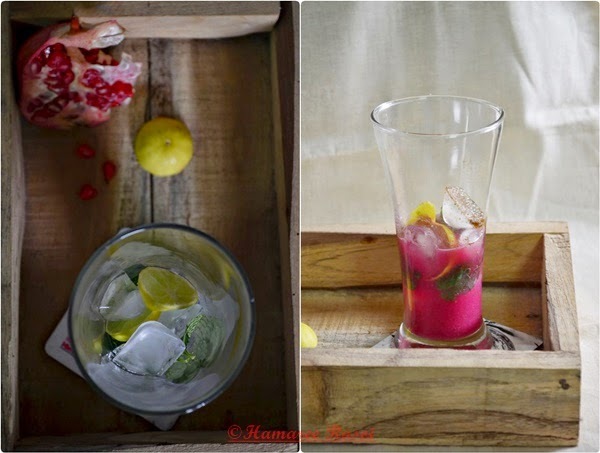 read more.. "Pomegranate Virgin Mojito (Himalayan Sparkling Water Contest)"
As a Bengali brought up in the North India the word Sandesh or Shondesh had two specific meanings. In Hindi it means as News. And in Bangla it means a Cottage Cheese based sweet. 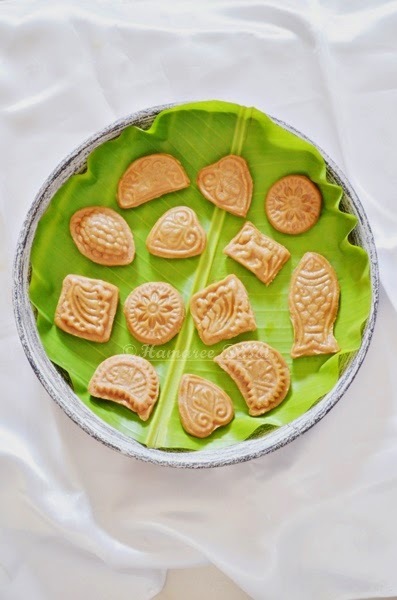 Legend has it that in early 18th century a sweet shop owner from Bengal called Bhim Nag had mastered in the art of preparing shondesh and after tasting which the Lady Viceroy of India was smitten by it and from there after there was no looking back for this sweet. 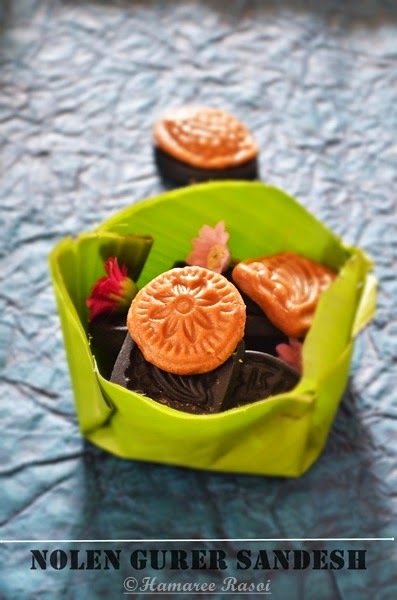 It surely has stood the test of time and there is no other traditional sweet which could be prepared in so many varied way. Recently I had prepared this for a baker’s meet at a popular hotel inChennai hosted by renowned food critic Rashmi Uday Singh. To my delight she liked it and featured it in the TOI Chennai edition. Making a good sandesh is an art, with practice only you can achieve best results. The mere mention of sandesh /sondesh makes me go weak in my knees. And believe me it is not a domain owned by Bengalis only anymore. I see people from many part of the world asking me recipes about the same. Some tried it from online sources, many followed it by following a recipe on books and magazines. Well when it comes to sandesh the flavours can be endless such as Aam Sandesh, Chocolate Sandesh, Nolen Gurer Sandesh etc. So depending upon the flavours the texture can also vary. What else you need: Few wooden or stone carved molds.I have got mine from my Mom and Granny. I just love collecting various shapes and designs. A big Sieve and a clean muslin cloth. To make chana/ chena, boil milk in a heavy bottom pan over medium heat. Keep stirring so that milk doesn't get burnt at the bottom. pour lemon juice over milk and stir. The milk will curdle just wait for 1 more minute and place the sieve with a muslin cloth. 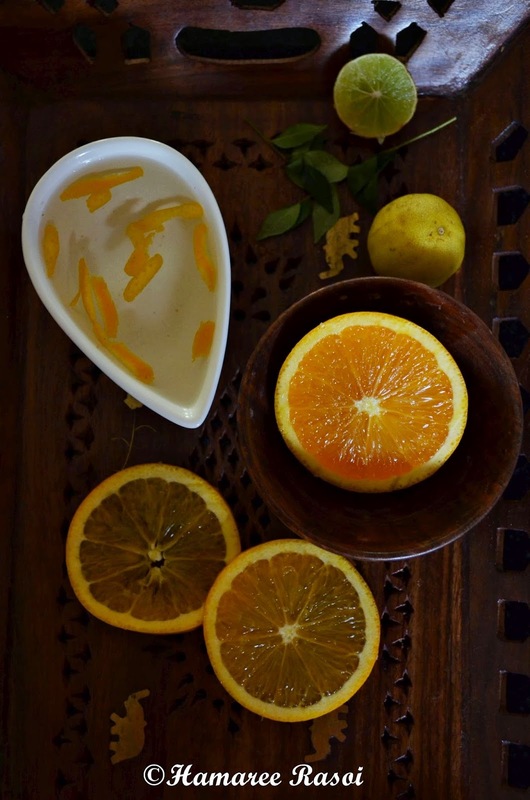 Strained the curdles milk and run it under tap water to remove the lemon trace. Tie the loose ends and hang it to the tap to drain our excess water for half an hour. Now my Aunt and Mom used to place this chena potli under a heavy utensil like Sheelnora but I like the little moist chenna for my sondesh so I skip this process. Now comes the kneading part where after transferring the chana/ chena to a clean flat plate you have to knead it with your finger and heel of your palm. Once the lumpy thing starts looking as smooth ball add powdered sugar in it and knead again for another 10-12 minutes. 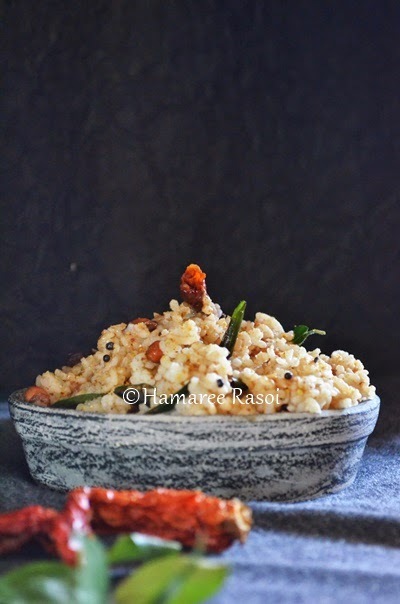 Take a non stick pan and add grated jaggery in it and keep stirring it on low heat. Once you get melted jaggery, add chena/chana mixture and mix thoroughly. Keep stirring this mixture for 2-3 minutes and you will see the mixture will tend to release the sides of the pan. Switch off the pan but stir it in between. Grease a plate with 1/2 tsp ghee and brush little ghee on the molds ( this step is done to avoid the stickiness of sandesh inside the molds). Let this cool down for 2-3 minutes or else you will have tough time rolling the lemon size balls between your palm. This stage is called Makha as it is yet to be shaped or go in various molds. Make small balls from Makha and press into the molds. Now carefully remove from the molds and place these in a serving pate. Cool until firm or you can have it warm also. 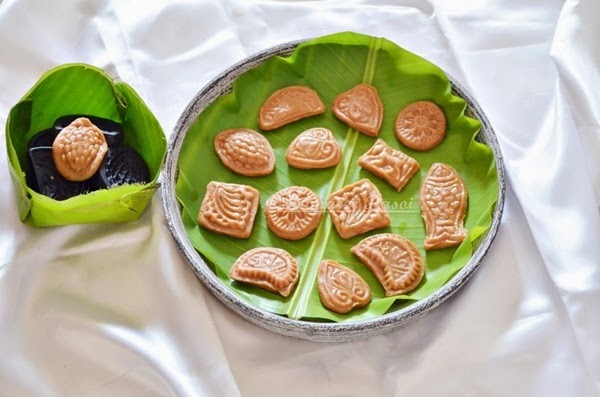 There are no hard and fast rules when it comes to Sondesh :-)These can be stored in refrigerator section provided they are in an air tight box. It is better if you keep an eye on chena while cooking as no one enjoys eating chewy outcome. Do not let the Makha cool down completely or else the mixture will get hard. So mold it when the Makha is still warm. 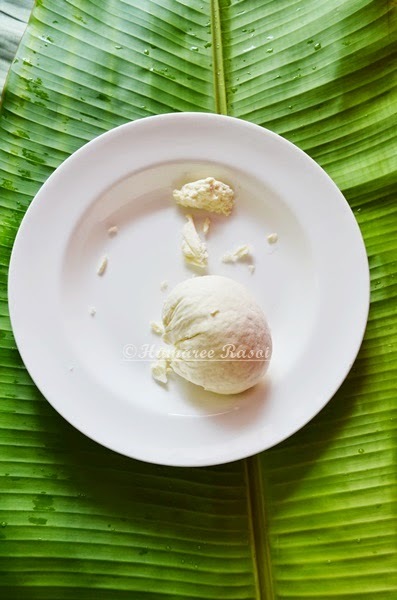 Do check out Pista Sondesh and MoongDal Sondesh also. 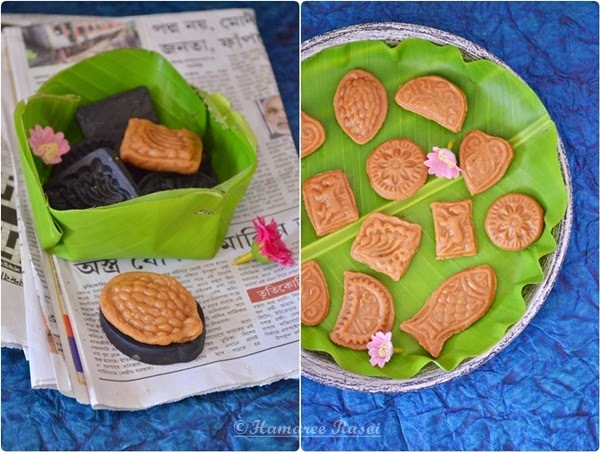 read more.. "Nolen Gurer Sandesh (Cottage Cheese Sweet With Date Palm Jaggery)an Ultimate Ecstasy for Any Bengali"